It seems as if Barcelona could be in for a stellar season this year if this stat regarding Lionel Messi is anything to go by. 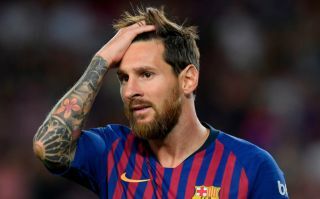 The Argentine, who is widely regarded as one of the best players of all time, scored twice in the club’s opening La Liga clash against Alaves in the Camp Nou. The forward’s first was a superb, low free kick that left Alaves goalkeeper Pacheco no choice but to watch the ball stroll into the net. Messi then bagged his second and Barca’s third with one of the last kicks of the game as Ernesto Valverde’s side got their league season off to a great start. However, it’s the 31-year-old’s first goal that may be a sign that the Blaugrana are in for a great campaign this year. As stated in the tweet above, every year that Messi has scored Barca’s first league goal of the season, they’ve gone on to win at least the league and the Champions League, with the club also winning the Copa Del Rey in two of those three seasons. This should be seen as a positive sign by Barca fans, one that may be signalling that Valverde’s side could be on their way to lifting club football’s most prestigious European trophy once again. It seems Messi isn’t going to slow down any time soon, something that Barca fans will be overjoyed with seeing as he’s the one player that makes things happen for their side. Only time will tell if Barca continue this streak and scoop up some more silverware this year, but for the time being, this stat should have Blaugrana fans optimistic for the season ahead.